Led by José Luis Moscovich, the spunky West Bay Opera hosted Jacques Offenbach’s Tales of Hoffmann Oct. 12 and 14, and will finish its run this weekend. At last Sunday’s matinee, this Palo Alto troupe brought a massive opera to the modest stage of Lucie Stern Theater, and did so with confidence and immediacy. Moscovich led a fine ensemble with wit and conviction—a number of the instrumentalists appear with other Bay Area symphonies. Their sound was focused and punchy, and the horns and woodwinds excelled. The curious libretto, which includes four bizarre storylines woven into one treacherous Jungian dream journey, was drawn from the pages of E.T.A. Hoffmann, a colorful German Romantic poet. Offenbach died before this last opera was completed, and finished the vocal lines, but left out much orchestration as well as the order of the three internal stories. The character of Hoffmann, a hard-drinking seeker of poetic truth, was played to the hilt by Christopher Bengochea, a tenor with a big voice to match that big personality. That voice was not the fluting stand-and-deliver of a recent Met sensation, but a reverberant middle register that wasn’t afraid to growl or get dirty… and he got plenty dirty! His nemesis, the Devil disguised variously as a lawyer, inventor or physician, was sung by Robert Stafford in a melodious baritone bass. Somehow, his personification of evil was intensified by the ease of his delivery. Asked afterwards how he got so into that character, he replied that when he first saw himself in costume and sharply arched eyebrows, he knew he had it. Balancing their conflict is the other story, the two female roles. One embodies the Goddess or Muse, performed by Betany Coffland in a warm and penetrating mezzo that often stole the show. The other role is really four: woman as innocence, woman as embodiment of passion, woman as deceiver, and “she who leaves.” Those four roles were all sung by Rochelle Bard in a tour de force that stretched from the sweet clarity of high coloratura to a toothsome lyric soprano. Matching that with acting was almost tougher. As Olympia, she had to embody innocence with the jerky motions of a mechanical doll, performing the famous “Les Oiseaux dans les Charmilles,” the Doll Song, with gorgeous high notes and creepy lifelessness. And as Antonia, she sang the role of a girl who chooses artistic passion even if it kills her… and the Devil makes sure it does! Then as Giulietta, she is a bordello madam with a penchant for deceit. Duh. But that role also includes one of the great duets of all time, “Barcarolle,” in which the Muse and the Madam embrace the joy of night. An excellent cast supports this story, with smooth baritone Martin Bell as the Innkeeper and as Giulietta’s lover, Carlos Aguilar as Instrument maker, and tenor Michael Desnoyers—in full Steampunk regalia—as Olympia’s creator. I last heard Desnoyer’s supple sound as Pluto in another bizarre Offenbach opera, Orpheus in the Underworld. I have enjoyed hearing Bell in many roles, and last heard Aguilar here as a gravel-voiced Hebrew Patriarch. Eschewing the frivolous for a disturbing dreaminess, director Ragnar Conde described his vision as “… the evolution of the artist.” His staging was always clever, with a fine balance of static images and believable action, and with lots of bodies, all in the right places. Jean-Francois Revon’s raked stage and multiple-use set, with its exaggerated perspectives, set a tone of jaunty simplicity, while his video images, overlaid on that set, supplied much of the scene changes. The lighting by Lucas Krech used conventional effects perfectly done to lead us through internal thoughts and dreams. When our anti-hero, Hoffmann, drifts into reverie while singing to his bar mates, he is softly lit and the stage is purpled with reds and blues. And when Hoffmann dons the rose-tinted glasses of love, all instantly plunges into pink hues—and when that affectionate outlook becomes more charged, a deeper blush settles across the set. 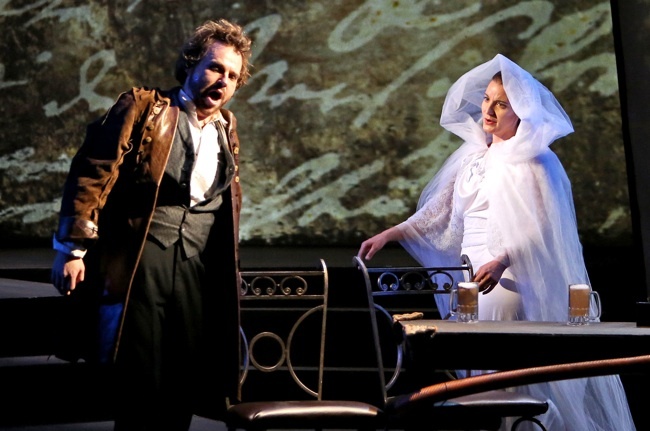 Hoffmann’s final choice between drunk and distraught lover and crazed favorite of the Muse? Come to Palo Alto and find out! If you want bang for your buck, the small theater, big voices, and vivid presentation deliver in spades. And as for accessibility and truth, listening to Moscovich and Conde discus Offenbach’s vision gave us a glimpse into the art behind the art. The West Bay Opera will offer “Tales” twice more, Saturday Oct. 20 at 8:00 p.m. and Sunday Oct 21 at 2:00 p.m. at the Lucie Stern Theatre, 1305 Middlefield Rd, Palo Alto. See their website for information and tickets: www.WBOpera.org or phone 650-424-9999. Photo below of Christopher Bengochea as Hoffmann and Betany Cortland as Muse; photo by Otak Jump.